Social Entrepreneurship and Innovation in Rural Europe investigates how social entrepreneurship advances social innovation in rural Europe and contributes to fighting social and economic challenges in these regions. Based on longitudinal data collected in four European countries, this book explains how social enterprises enact their business model based on an entrepreneurial reconfiguration of resources they obtain from their network relations, and how their activities empower local communities, driving change and eventually innovation. In these activities, the entrepreneurial mindset and the role as intermediary between different groups and domains of society help to reframe challenges into opportunities. The argument in this book develops from a description of what social enterprises report to do to an analysis of how they do it, and results in an explanation of why they take these actions. In doing so it gradually broadens the view from a focus on the social enterprises themselves to their interactions and network partners and, finally, to their positioning in societal fields. The presented model complements network theory with the concept of strategic action fields. 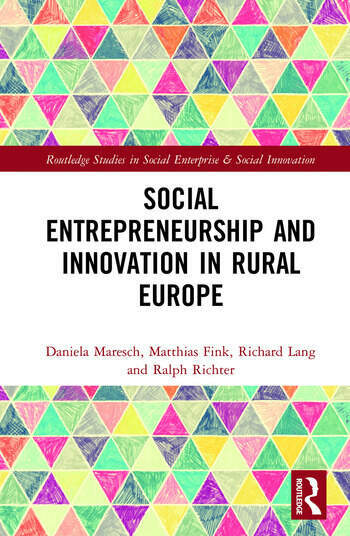 This book reveals the crucial role of social entrepreneurship in innovation in rural regions, and the rich insights provided have far reaching implications for research, practice and policy. This book will appeal to everyone interested in the interface of social entrepreneurship, innovation, and regional/rural development, either on a practical or academic level. Ralph Richter is a senior researcher and lecturer. At the Leibniz Institute for Research on Society and Space (IRS) in Erkner/Germany he has conducted the EU funded research project "Social Innovation in Structurally Weak Rural Regions" (RurInno). Matthias Fink is vice head of the Institute of Innovation at the Johannes Kepler University Linz, Austria and a Professor for Innovation and Entrepreneurship at ARU Cambridge, UK. In addition, he is academic director of two MBA programs at LIMAK Austrian Business School. Richard Lang is Assistant Professor at the Institute of Innovation Management at Johannes Kepler University Linz, Austria, and a Honorary Senior Research Fellow at the School of Social Policy at University of Birmingham, UK. Daniela Maresch is an Associate Professor at the University of Southern Denmark (DK) and an Associate Senior Researcher at the Institute of Innovation Management (IFI) at the Johannes Kepler University Linz (A).